10X Earn 10 points per $1 spent when you stay at an IHG hotel. 2X Earn 2 points per $1 spent on purchases at gas stations, grocery stores, and restaurants. 1X Earn 1 point per $1 spent on all other purchases. Hotel signup bonus points. Spend $2,000 in the first three months to earn 80,000 bonus points and a total of $5,000 in the first six months to earn an additional 40,000 bonus points. Additional perks like a Global Entry or TSA Precheck credit and bonus points for purchases on gas and groceries make this a contender for top hotel card. Compare this to other top hotel credit cards. 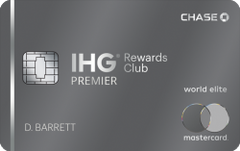 Our take: Though IHG points are a bit inflated, the 80,000-point bonus on the new IHG Rewards Club Premier card is a great incentive to sign up.